Read about Shasta Kearns Moore’s visit as a PFAD Guest Principal with Franklin High School Principal Chris Frazier, published by the Portland Tribune. View a Facebook photo album of some of the guest principals at Reynolds School District including Warner Pacific University president Andrea Cook, Troutdale Mayor Casey Ryan and Moda Health Corporate Social Responsibility Manager Karis Stoudamire-Phillips. Watch a video produced by PPS Communications that highlights the visit by All Hands Raised Board member and Incight Founder, Scott Hatley to Arleta School with Principal Diana Kruger. 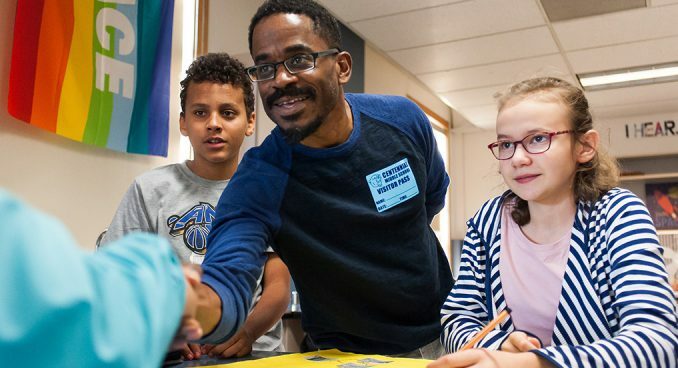 Check out some of the guests who visited David Douglas School District, including Portland Mayor Ted Wheeler in Part One and Part Two of their Facebook Albums. We hope you will continue to stretch beyond your Principal for Almost ONE Day and carry with you the sentiment that Portland Business Journal Publisher Craig Wessel shared at the lunch—Your words are powerful, and sharing the experience you had during PFAD with your colleagues and friends is one of the most powerful ways to keep the momentum from the day going. Christina Lincicome with SAIF visited Principal Shawn Garnett at Markham Elementary School. As a result, SAIF has committed to participating in Markham’s library book challenge. Stephen Endy of Mahlum Architects spent the morning with Michael Navarro, Principal of Youth Progress. Mahlum will now be helping the program design cafeteria space for their students. We encourage you to keep the stories coming on social media using the #PFAD18 or by emailing them to tessa@allhandsraised.org. This photo album captures some of the special moments from our shared experience. Special thanks again to our presenting sponsor Comcast, and to supporting sponsors Kaiser Permanente, Umpqua Bank, New Seasons Market, Portland Business Journal, and Warner Pacific University. And thank you to all of our local school leaders for dedicating so much time and energy to ensuring your guest(s) had a robust and rewarding morning–we are grateful. On behalf of the entire All Hands Raised staff, thank you again for raising your hand to build stronger bridges between schools and community. P.S. — Two important resources for educators were highlighted at the PFAD luncheon–Comcast’s Internet Essentials Program and Wells Fargo and the Portland Trail Blazers Take it to the Court Grants. Learn more about how to access internet resources for students and families in need, and how to apply for the Take it to the Court Grants.